We’d love your help. 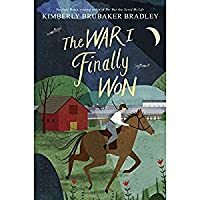 Let us know what’s wrong with this preview of The War I Finally Won by Kimberly Brubaker Bradley. Ada and her younger brother, Jamie, now have a permanent home with their loving legal guardian, Susan Smith. Although Jamie adapts more easily, Ada still struggles with the aftermath of her old life, and how to fit into her new life. World War II continues, and forces the small community to come together and rely on one another. Ada has never been interested in getting to Ada and her younger brother, Jamie, now have a permanent home with their loving legal guardian, Susan Smith. Although Jamie adapts more easily, Ada still struggles with the aftermath of her old life, and how to fit into her new life. World War II continues, and forces the small community to come together and rely on one another. Ada has never been interested in getting to know her friend’s family—especially Maggie’s mother, the formidable Lady Thorton. However, circumstances bring them in close proximity along with other unexpected characters. Ada comes face to face with another German! This time she isn’t sure what she should do. How can she help the ones she loves and keep them safe? Ada’s first story, The War that Saved My Life, won a Newbery Honor, the Schneider Family Book Award, and the Josette Frank Award, in addition to appearing on multiple best-of-the-year lists. This second, marvelous volume continues Ada’s powerful, uplifting story. To ask other readers questions about The War I Finally Won, please sign up. Kimberly Bradley I don't know yet. Maybe? As I read the book, I felt sure that (spoiler alert) Jonathan would have parachuted out of his plane and been captured, unbeknownst to the other pilots. That could still happen in a 3rd book, which I am hoping for!! Will there be a 3rd book? I notice you are not answering that question! I *loved* The War That Saved My Life and friends, this is a worthy sequel. I am in awe of Kimberly Bradley's ability to create characters that are so real, feeling emotions that are so raw that the reader can't help but feel them, too. The growth and development of these characters through the story is masterful. I just loved it. I wished it was longer, which was a thing I NEVER wish because finishing a book and marking it as "read" is one of my great pleasures. But I would spend all the time in I *loved* The War That Saved My Life and friends, this is a worthy sequel. I am in awe of Kimberly Bradley's ability to create characters that are so real, feeling emotions that are so raw that the reader can't help but feel them, too. The growth and development of these characters through the story is masterful. I just loved it. I wished it was longer, which was a thing I NEVER wish because finishing a book and marking it as "read" is one of my great pleasures. But I would spend all the time in the world with Ada. Trying to put this review into words is so difficult. The story, the characters, the history...it was all done SO well. Kimberly allows us to see Ada to her core. She begins to help us understand the impact of neglect and abuse, the gravity of war, and depth of beginning to understand a concept that is too deep to put into a simple conversation with children. I cannot highly recommend this book enough. I cannot wait for Ss to have this book in their hands come October. The Swiss Family Robinson got shipwrecked onto a beautiful island where everything turned out splendid for them. Jamie loved the story. I had always disliked it. I hated it now. So interesting to see what it was like for children, on the ground in England. So much is written (or at least, most of what I've read) is either about children in America, or in Germany. So interesting to see how far along the war was for England before the US joined, and their attitude toward Hitler and the Germans. Feliz por saber o que aconteceu com Ada depois do primeiro volume. This stories continues just where The War That Saved My Life finished. Having loved the first book so much I was surprised that the sequel was just as good if not more enjoyable, we were so excited to have the chance to read more about these wonderful characters. This story continues with the characters lives during WWII, the book spans a couple of years, we learn more about characters from the last book and a new character, Ruth joins the family. Susan continues to be a wonderful mother and hel This stories continues just where The War That Saved My Life finished. Having loved the first book so much I was surprised that the sequel was just as good if not more enjoyable, we were so excited to have the chance to read more about these wonderful characters. This story continues with the characters lives during WWII, the book spans a couple of years, we learn more about characters from the last book and a new character, Ruth joins the family. Susan continues to be a wonderful mother and helps Ada with love and understanding to work through her problems. We see more heartache from the war and although parts are very hard to read aloud, despite the sadness and loss the book is uplifting and positive. There are some wonderful animal characters in this story and those who love horses will find so much enjoy in this book. We enjoyed the details of WWII life, the food rationing, the meals they ate, the war work the villagers did. It was enjoyable to read about a time when people of all classes came together for once and had more shared experiences. This sequel starts right up where book 1 left off; the 2 books make up 1 story. I think it keeps getting better and better. I do think it’s important to read book 1 before reading book 2. I stayed up very late to finish reading. All the way through it was a hard book to put down. It’s a page-turner. I’m considering adding it to my favorites shelf. It’s definitely a solid 5 star book for me. How often is a sequel even better than the first book?! Here it is, and I also gave the first book 5 stars. I This sequel starts right up where book 1 left off; the 2 books make up 1 story. I think it keeps getting better and better. I do think it’s important to read book 1 before reading book 2. It’s a masterfully and beautifully told story. It has an incredibly appealing voice in the main character narrator Ada and a writing style that I love. All the characters are brought vividly to life. The plot and its pacing is perfection. I loved the newly introduced character Ruth and enjoyed the increased depth to many other characters, particularly the adults. I continue to love Susan, a nearly perfect natural therapist and mother and appreciate how she’s shown as flawed and not actually perfect. I loved how one thing about her past was resolved. Ada is a great character to root for and I did. This account shows a healing from trauma that is realistically shown, optimistic but not at all unrealistic. The single page author’s note at the back talks about two aspects of WWII that were a bit cryptically woven into the story and was a welcome addition. It’s a must read additional page. This book is intense but always stays appropriate for middle grade readers (and young adult readers) despite the sometimes heavy subject matter, including WWII and its causalities and the realities of civilian life during the war, the Holocaust, child abuse and neglect, traumatic loss, adult sexual and romantic relationships (far off the page), and other such things. It might not sound like a children’s book but it is, though unlike the first one I think it is also a young adult book, although it’s one that I think can be enjoyed by all ages. Both books are all ages appropriate and I think will appeal to some adults who don’t normally read books for younger readers. Highly recommended for readers who enjoy any of the following: coming of age stories, stories about WWII especially as it impacted England and the Jews, horse lovers, cat lovers, family stories including atypical family stories, orphan stories, and stories where both child an adult characters grow and change in a realistic way. Six stars for this second and final book in the series. I wish I had more time to write a review. This book has everything: First, it is a page-turner. The characters are so real that I don't think I will ever forget them (even with my insomnia brain). The writing is simple and beautiful. This is the kind of book that makes me glad that I don't worry too much about who the audience is when I choose my next read because there are some extraordinarily talented writers out there writing for YA and Six stars for this second and final book in the series. I wish I had more time to write a review. This book has everything: First, it is a page-turner. The characters are so real that I don't think I will ever forget them (even with my insomnia brain). The writing is simple and beautiful. This is the kind of book that makes me glad that I don't worry too much about who the audience is when I choose my next read because there are some extraordinarily talented writers out there writing for YA and middle grades, and this author is one of them. The themes are numerous and include what it means to be part of a family / non-traditional families, love of all kinds, loss and grief, what it means to be at war and how do you know who the enemy is when you are at war (because it's not always simple), faith and belief, friendship, trust, coming of age, and so many other things. I'm being careful not to bring in any type of spoiler here. I switched between the audiobook and the paper book, as I do with almost everything I read. The narrator is Jayne Entwistle, who wasn't my favorite narrator at the beginning because I associate her with the Flavia de Luce character, who is a know-it-all and the voice she uses here for the main character, Ada, is the same one she uses for Flavia. Well, by the second book, it was working for me. She changes convincingly for all of the different characters and does a beautifully moving job of conveying the mood and meaning of Brubaker's wonderful words. "Love isn't as rare as you think it is...You can love all sorts of people, in all sorts of ways. Nor is love in any way dangerous." I've devoured this series within a week of "discovering" it, and now don't know what to do with myself. Thoroughly enjoyable and edifying. I would eat it if I could. I loved all of the historical elements that Bradley weaved into this story, an account of war in the English countryside from the perspective of a young girl evacuated from East End London. Though she's healed physically, the internal struggles with fear and anger Ada is in the process of overcoming, were written in such a charming manner. I forgot many times that I was reading a middle grade novel. Pssssh. This hit a heart spot in the way only shows like Home Fires, Call the Midwives, and Anne with an E can. I hope deep down that there will be a sequel to the sequel. One can dream, can't they? Whoa, one of the few books of this year I longed to return to and mourned its end. Ada's prickly voice shines. Lady Thorton more than makes up for the one-note Mam of the first book. A thornier Marrila Cuthbert. I read this book in my own language because my knowledge in English isn't yet good. I think that the first book is excellent, but the second one is just good. The problem with the second book is that the end was a little fast and unsatisfactory for me. You cannot read this book without first reading The War that Saved My Life - but if you read that one, I can't imagine you wouldn't want to read this one! Classified a middle grade read, this book picks up where the first leaves off. My heart was full while reading this one, as I not only got to see our Ada grow into her own and tackle her demons but I met other characters that charmed me as well, most notably Ruth. 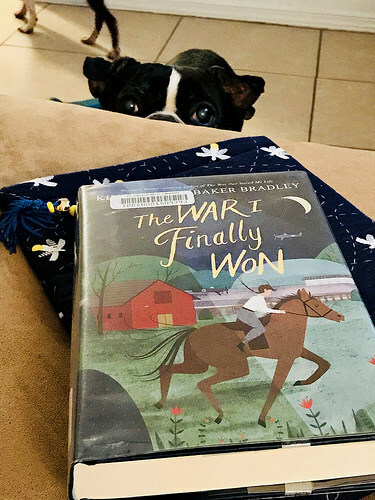 The story (series) is a way to teach younger students/children about an important You cannot read this book without first reading The War that Saved My Life - but if you read that one, I can't imagine you wouldn't want to read this one! Be sure to read the Author's Note in the back of this book if you do pick it up - I so love Author's Notes! Thanks to my NI friend, Sarah, for recommending these books and to Moderator, Shelli, for suggesting we have a lighter go of reading for the holidays which led to this series' nomination. Read or listen to them both immediately, but don't say I didn't warn you. This is one of the best novels of 2017. جلد دوش آدم رو ناامید نمیکنه، جلد یک رو تو ذهن خراب نمیکنه، پشیمون نمیشی از اینکه خوندیش؛ اما خب واضحا لذت و خاص بودگی جلد یک رو هم نداره. البته که این یکی خیلی بیشتر از قبلی درگیر جنگه و این نقطهی قوتشه؛ که قبلی داستان آدا بود، این یکی داستان آدا در جنگ و ارتباط آدا (و بقیه) با جنگه. ۲-۳ صفحهی آخر انگار پاسخی بود به توقع و درخواست من از داستان، دربارهی بیشتر، و بدون پنهان کردن و یه جور جلد دوش آدم رو ناامید نمی‌کنه، جلد یک رو تو ذهن خراب نمی‌کنه، پشیمون نمی‌شی از اینکه خوندیش؛ اما خب واضحا لذت و خاص بودگی جلد یک رو هم نداره. البته که این یکی خیلی بیشتر از قبلی درگیر جنگه و این نقطه‌ی قوت‌شه؛ که قبلی داستان آدا بود، این یکی داستان آدا در جنگ و ارتباط آدا (و بقیه) با جنگه. OH NO MY BAD, I'M CRYING. I'M CRYING SO MUCH. I'M CRYING SO MUCH IT'S MAKING YOU CRY TOO. BUT LIKE IN A GOOD WAY THOUGH. A perfect historical novel. Kimberly Brubaker Bradley seamlessly combines WWII realities--ration books, fire watching, displaced Jewish Germans in the village (or the home), Anderson shelters, Land Girls, air raids, secrecy--with the fictional story of Ada and Jamie, orphans after their mother's death during the London Blitz, struggling to embrace and accept an unexpected, unconventional, long-suffering and ultimately supportive family. Great writing, wonderful story arc, simply beautiful. With a A perfect historical novel. Kimberly Brubaker Bradley seamlessly combines WWII realities--ration books, fire watching, displaced Jewish Germans in the village (or the home), Anderson shelters, Land Girls, air raids, secrecy--with the fictional story of Ada and Jamie, orphans after their mother's death during the London Blitz, struggling to embrace and accept an unexpected, unconventional, long-suffering and ultimately supportive family. Great writing, wonderful story arc, simply beautiful. 5 stars isn't enough for the sequel to Ada's story. Beautiful from beginning to end! I thoroughly enjoyed this sequel to The War that Saved My Life. I read both books aloud to my 9 year old daughter and we were both completely enthralled. I loved getting to see how Ada grew and healed over the course of the story and the introduction of Ruth, a German Jewish girl, really helped to teach her about a horrible thing that happened without going into the nitty gritty details before she's ready for them. We also really appreciated the discussions about religious beliefs and comparisons between Christian and Jewish beliefs. She has relatives who are both and this was a great lead in to a conversation about that. Já tinha adorado o primeiro livro e este foi também um livro muito bom. Um livro sofrido, sobre a guerra e o que está ensina a uma menina. Muito bom. When last we left our evacuees, Ada Smith and her younger brother Jaime, they had been taken away from Susan Smith (no relation), with whom them had been living after being evacuated from London, and brought back to London by their mother despite the constant bombing. Sure enough, one night during an air raid, they don’t make it to the shelter because of Ada’s severely clubbed foot, and in the midst of everything, Susan appears to take them back to her house in the countryside. Now, with her club When last we left our evacuees, Ada Smith and her younger brother Jaime, they had been taken away from Susan Smith (no relation), with whom them had been living after being evacuated from London, and brought back to London by their mother despite the constant bombing. Sure enough, one night during an air raid, they don’t make it to the shelter because of Ada’s severely clubbed foot, and in the midst of everything, Susan appears to take them back to her house in the countryside. Now, with her club foot surgically corrected, thanks to the generosity of her best friend’s wealthy parents, Lord and Lady Thorton, Ada returns to the country with Susan and Jaime. And, since Susan’s house has been destroyed by a bomb, they will be living in a cottage on the Thorton estate. Then word comes that Ada’s mother was killed in a bombing raid, and Ada finally begins to feel that maybe she isn’t the terrible person her mother always said she was. When Susan becomes their legal guardian, Jaime immediately begins to call her Mum, but Ada can’t bring herself to do that, and actually resents that Jaime could do it so easily. Calling Susan Mum would require a level of trust that she will always be there, and as Ada knows all too well, you just can’t count on that during a war. When the government requisitions the Thorton manor for war use, the very formidable Lady Thorton moves in with Susan, Ada and Jaime. And when Ruth, a Jewish refugee from Germany is brought there by Lord Thorton to receive math instruction from Susan, so that she can eventually join him in his secret war work in Oxford, things really get tense. Ada and Jaime are convinced that Ruth is a spy, but Lady Thorton takes an immediate dislike and intense to Ruth, seeing her only as a enemy German, and the reason her son Jonathan had joined the RAF and put his life in danger. Ruth and Ada don’t hit is off, either, until they discover a mutual love for horses. But Lady Thorton refuses to let Ruth anywhere on the estate property, except the cottage, and especially the stables. When Susan gives her horse Butter to Ada as a gift, Ada lets Ruth ride her in secret and slowly the two girls develop a fragile friendship. There is lots going on in The War I Finally Won, which I liked. War is a chaotic, confusing, demanding time and Bradley has really captured that. At the same time, the characters that appeared in The War That Saved My Life have the same feel to them, as they should, and even Jaime, whom I felt was a little thin as a character before has become a more developed personality. The thing I found most interesting was the relationship between Susan and Ada. In the first book, it seems so clear cut, but now, Ada keeps Susan at an unexpected distance. Why? With her mother dead and gone (no, that is not a spoiler), I had expected that the three of them would form a nice, lasting family unit. But, ironically, it will take more loss, more sorrow and the realization that anything could really be gone in the blink of an eye for Ada to finally see the need to let herself trust more and that is the war she must finally win. 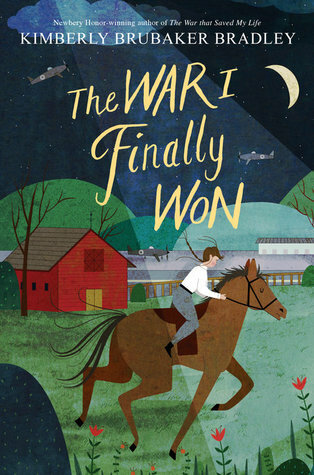 The War I Finally Won is so more than just a satisfying coming of age sequel. While it explores the theme of trust, within that theme, it also explores the idea of how we define family. For those who haven’t read the first book, The War That Saved My Life, I would highly recommend doing so (though it isn’t necessary to enjoy this second book). Luckily, The War I Finally Won won’t be available until October 3, 2017, so there’s still plenty of time to read, or for some to re-read book 1. I read The War that Saved My Life last year and loved it. It was one of the best books I've ever read. Since last year I've been waiting eagerly for the second book of the series. Now that I've read it I feel awful! I was kind of hoping maybe this book wouldn't be as good as the first installment. However, I was wrong. Kimberly Brubaker Bradley once again won my heart! Firstly, I would like to mention that Kimberley was very good with Child Psychology. The way she und I am emotionally drained! Firstly, I would like to mention that Kimberley was very good with Child Psychology. The way she understood Ada was amazing! Ada had undergone a lot since her birth. She had a club foot and her mom was so hateful that just remembering her gave Ada stress disorder. Because of her terrible memories, Ada was not a very easy girl to love. She wasn't easy to reason with. Susan, however, understood her very well! She loved Ada dearly and made her feel safe for the first time in Ada's life! She also helped Ada to fix her club foot. And there was Maggie who too loved Ada like a sister. And there was Jonathan who was very kind and gentle and his inspiration was Ada. He was willing to name his Plane "Invincible Ada" after Ada! And there was Ruth who had been through a lot just because she was born in a Jewish family. And just because Hitler chose to hate Jewish people she had to leave her country Germany to England. I felt really sorry for Ruth while she was staying at Thorton's cottage. No one would trust her as she was a German. She didn't know whether her family members were safe. War could tear a family apart. Everyone had been through hell because of the Holocaust. In this book, Kimberley didn't just write about war but also draw a clear picture of Ada and her surroundings and her feelings. Ada had a hard time to cope with kindness and love for she has always been treated poorly. Her battle was against her personal insecurities and disbelief. I am glad finally she won her battle and able to love back! We all need something to lean on to make ourselves comfortable when we feel down. In Ada's case horse was her comfort zone! And it was true for Ruth as well. So, when Ruth was emotionally drowning Ada let Ruth ride on her horse, Butter, despite Lady Thorton's prohibition! It indeed was a very brave and kind thing to do! This was excellently written, with a much better plot than the last book. I did call the main plot twist from MILES away, but somehow that didn’t detract from it. The storyline is still slow, like the last book, but it’s much more complex and engaging. Plus, Ada’s voice and character development was really, really well-done. I like how this author sticks with middle-grade level prose to get us inside Ada’s world. The whole atmosphere of this book was kinda cool, also. The main negative is that the characters muse about death/heaven a lot and reach some unbiblical conclusions. For the most part, the author avoids making any DIRECT assertions, but that could still be confusing for younger readers. The Bible makes it clear that if Jesus’ blood doesn’t cover your sins, then you’re not going to Heaven when you die. This book is sequel of THE WAR THAT SAVED MY LIFE. This was the "evil" twin sister. The one you play with and think "Oh she's sweet!" But then you get home and start thinking of the way she played and then it's like "Hmm... Maybe that wasn't so nice after all!" This was that book. It didn't need to be a sequel and it didn't need a particular character but she showed up anyway... I enjoyed MY LIFE but I can't say I wholeheartedly enjoyed this one. Maybe I was expecting too much? I think this is my favorite book so far this year. I could hug it. I could start right over at page one and read it again in another big gulp. The way Bradley explores how different characters process trauma and loss is masterful. Woven throughout the whole book there are also such strands of joy and beauty. Tenian razon , me gusto mas que la primer parte. me hizo reir y llorar. aun doy vueltas que poner por aqui. This was excellent. And one of those books where I read the sequel years after the first one and didn't feel frustrated the whole time by not being able to remember the first book. با اینکه "جنگی که نجاتم داد" هم دوست داشتنی بود اما این رو خیلی بیشتر دوست داشتم.انگار واقعا اون کتاب به ادامه نیاز داشت تا شخصیت ها واقعی تر جلوه کنن و بهتر بفهمیمشون.درگیری های ذهنیِ حتی بعد از خوب شدن پای آدا (مثل اینکه به این فکر میکرد که شاید واقعا مشکلی به جز پاچنبری داشته که مادرش اونقدر باهاش بدرفتاری میکرده و اونو ... لقب میداده) و وقتی کم گم باور میکند که مشکل از خودش نبوده و مامش مقصر بوده به این فکر میکنه که چرا مامش همچین مشکلی داشته و فکرهای خودش و حرفای بقیه در مورد اینکه مامش ضعی با اینکه "جنگی که نجاتم داد" هم دوست داشتنی بود اما این رو خیلی بیشتر دوست داشتم.انگار واقعا اون کتاب به ادامه نیاز داشت تا شخصیت ها واقعی تر جلوه کنن و بهتر بفهمیمشون.درگیری های ذهنیِ حتی بعد از خوب شدن پای آدا (مثل اینکه به این فکر میکرد که شاید واقعا مشکلی به جز پاچنبری داشته که مادرش اونقدر باهاش بدرفتاری میکرده و اونو ... لقب میداده) و وقتی کم گم باور میکند که مشکل از خودش نبوده و مامش مقصر بوده به این فکر میکنه که چرا مامش همچین مشکلی داشته و فکرهای خودش و حرفای بقیه در مورد اینکه مامش ضعیف بوده باعث میشه اون شخصیت صرفا سیاهی که فقط سیاه است و هیچ نشانی از فهمیده شدن در جلد قبلی ازش ندیده بودیم کمی فهمیده شود. و در نهایت بهتر شدن حال آدا. "... آدا!مادرت الان دیگه نمیتونه اذیتت کنه.دیگه هیچوقت نمیتونه بهت آسیب بزنه. ولی میتوانست.مام هیچوقت مرا دوست نداشت و اگر زنده بود هنوز هم دوستم نداشت.این برای همیشه اذیتم میکند."